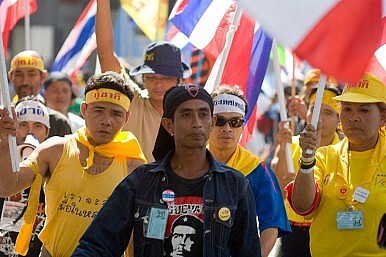 The exploitation of lèse-majesté laws for political gain are undermining human rights in Thailand. Violence is looming. Thailand’s human rights situation has set alarm bells ringing, as the space for freedom of expression becomes frighteningly constrained. Indeed, open discussion of the much revered monarchy risks becoming a taboo in the country as groups aligned with the royalists continue to exploit lèse-majesté laws to silence political dissent. Since the military coup in 2006, cases of lèse-majesté have multiplied. In 2005, 33 charges came before the Court of First Instance, which later handed down 18 decisions in these cases. By 2007, the number of charges increased almost fourfold, to 126. This number jumped to 164 in 2009, and then tripled to 478 cases in 2010. The most dramatic increases occurred under the Democrat Party-led government of Abhisit Vejjajiva, which adopted a royalist line strongly backed by the military. But it has been a number of recent high-profile cases that have really underscored the misuse of lèse-majesté law and the gross violations of human rights taking place in Thailand today. The arrest of a 62-year-old Thai-Chinese man, Amphon “Akong” Tangnoppakul, who was sentenced to 20 years in prison, shocked many Thais. He allegedly sent four text messages insulting the Queen and the Crown Prince. Amphon has always maintained his innocence. Joe Gordon, or Lerpong Wichaikhammat, a Thai-born American, was jailed for two and a half years in Thailand after posting online excerpts from banned book, The King Never Smiles, while living in the United States. The U.S. government criticized the lèse-majesté law, but was taken aback by the response of Thai hyper-royalists, who called for the expulsion of the U.S. ambassador to Bangkok. More staggeringly, Abhinya Sawatvarakorn, nicknamed Kantoop, or “Joss Stick”, a 19-year-old student at Thammasat University, will be charged with lèse-majesté over comments she made on Facebook two years ago. Kantoop was accused of committing lèse-majesté in April 2009 while she was still in high school. She will be one of the youngest ever to be charged under the law, and has already been through a catalogue of “social punishments.” For example, she was reportedly refused admission into Silpakorn University, where some professors painted her as an anti-monarchy figure. She also had a shoe thrown at her by a student at the esteemed Thammasat University, where she currently studies, and has been forced to change her name to avoid being recognized – and possibly attacked. Recognizing the unprecedented surge of charges under the lèse-majesté law, young law professors from Thammasat University, who formed the group called Nitirat, or “law for the people,” have been campaigning for amendments to the law. But an even more important objective for them has been to create a more equal society, in which people are not forced to live in fear simply because they disagree with the role of the monarchy in politics. In essence, Nitirat has proposed relaxing penalties, and only allowing the Office of His Majesty’s Principal Private Secretary to deal with complaints regarding lèse-majesté cases to prevent misuses of the law. But the group is now being accused by hyper-royalists of attempting to overthrow the monarchy. Being accused of trying to overthrow the monarchy is a serious claim in Thailand, and the process of branding political enemies of being disloyal to the royal family serves to justify the elimination of such enemies through the most vicious means.